Forgive the disguise, but the VW Tiguan Allspace - essentially a stretched, seven-seat version of the existing Tiguan - won’t be revealed until the Detroit motor show in January, so its makers are eager to keep its look under wraps for now. The location of that launch is significant, because this model is intended to play a key role in persuading Americans to consider VW post-Dieselgate and has been designed very much with that market in mind. Overall, the Allspace is 22cm longer than the standard Tiguan, with 11cm of that length incorporated in the wheelbase - a detail that is crucial for slotting the third row of seats into the car. While never easy, the engineering has been made simpler because the car sits on a modified version of the same MQB platform as the Tiguan. Adding to the versatility, the middle row of seats can be slid fore and aft and there is a bigger - if still undefined - boot if you select to fold the rearmost seats down. Even with the bodywork's disguising swirl patterns in place, it’s easy to discern that, aside from the stretched rear doors and a lengthened window behind the C-pillar, the Tiguan Allspace stays true to the look of its little brother. That’s no mean feat, as many a stretched car has lost something in translation in the past. The UK engine line-up is expected to mirror that of the standard Tiguan's 2.0 TDI diesel options and a choice of 1.4 and 2.0-litre petrols. On this drive of a prototype undergoing hot weather testing in South Africa, we were only able to sample a US-spec car, powered by a 185bhp 2.0-litre petrol, on predominantly gravel roads. It's a decent enough powertrain but irrelevant to European buyers. Of more interest was a chance to sample the rearmost seats (even if we couldn't photograph them). It wasn’t an easy task, such is the tightness of space. Small children will be fine, but even the smallest of adults would struggle to go two up in the back, and even then the middle row would need pushing forward so far that it would compromise space there, too. In summary, the added seating row increases practicality, but we’d urge potential buyers to test that it meets their needs first. Elsewhere, the car is entirely reminiscent of the standard Tiguan, as you’d expect. That means a neat, tidy and plush-feeling cabin that is short on flair but big on quality and with a well thought through driving position and comfortable seats. It is sure-footed if uninspiring to drive but does everything in a notably fuss-free way. Key to the Allspace’s success will be pricing, which VW isn’t giving clues on yet. The step up from the standard model needs to be competitive, though, because the rearmost seats - the principle purpose for buying the car - only have a narrow useable scope. 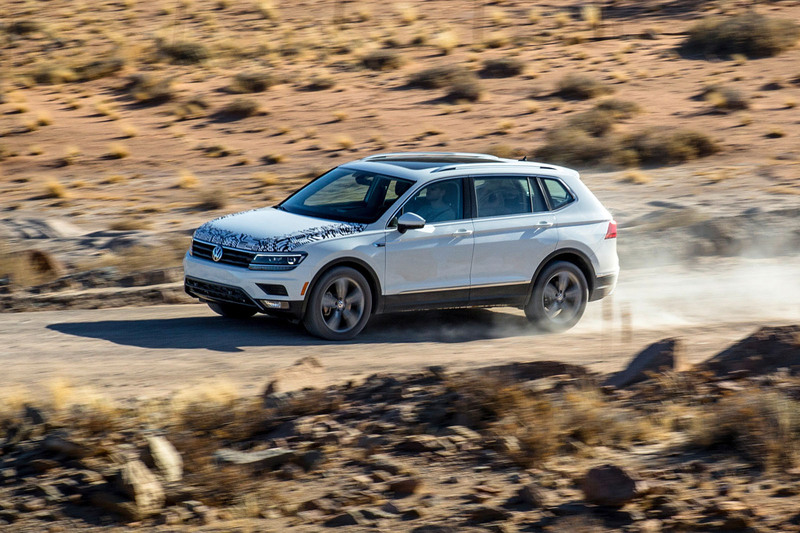 It’s easy enough to imagine a Tiguan customer being talked up into one, but less certain that buyers considering other cars would rush to a dealership to try it. Location South Africa; On sale May 2017; Price na; Engine 4 cyls, 1998cc, petrol; Power 110bhp; Torque na; Gearbox 6-spd dual-clutch automatic; Kerb weight na; 0-62mph na; Top speed na; Economy na; CO2 rating/BIK tax band na Rivals Skoda Kodiaq, Nissan X-Trail. Something HAS been lost. And imo the regular Tiguan isn't that great looking either ( unless it's in R Line guise ). Much better to go for its Czech cousin, the Kodiaq. That seems like a properly good looking car, and apparently comes with usable seats in the back. Globally, this Tiguan Allspace is the right size, a 5+2 seater rather than full 7 seater as the Atlas fills that role. Between the Allspace, the Kodiaq and Atlas, VW Group have a choice of 3 different 7-seaters - better than any other group. Not forgetting the Sharan/Alhambra, Caravelle, Transporter Shuttle, Caddy Maxi Life (some of which are even available with 4x4).